A few weeks away really doesn’t have to be any different than packing for a few days away, if you plan it right. There is rather a large subculture these days for people that Pack Light. There are whole forums devoted to one bag culture. These are people that try to travel in one single small backpack. Well, the good news is you don’t have to travel that light, but you can take what they have learned and build it into your own system. How many trips have you gone on where you have taken things and brought them back and never used them? We are all guilty of this. We pack for what might happen, not what will happen. To take this to the absurd, you aren’t packing a ball gown or a tuxedo, on the off-chance that you are going to get invited to a high-class event of the year. So dumb that down a little bit, and realize you should only take for what you absolutely must take. Here are some good things to know. Minimize everything you possibly can. Imagine in your mind that you’re going to be walking across a desert. Do you really want to be lugging heavy clothing and extra pairs of hiking boots? Keep it simple and keep it light. Learn to layer, instead of bringing multiple shirts, you can bring a few thinner t-shirts to rotate them in layers, this will keep you warm and clean and not break your back when you try and carry it. Minimize, bring 2 pairs of shoes, one pair on your feet and one pair in your bag. Casual and slightly less casual, and you are covered. You can wash clothes on a trip, or have them washed for you, so you do not need a different outfit every day. The majority of the clothing you want is casual and comfortable clothing. That’s not to say you should not bring at least one outfit that you can pass into a nice restaurant with, but you are on vacation so keep it on the Casual side. Two or three casual outfits and one nice outfit will carry you a very long way for a very long time. If you can get it, get fast dry clothing. There is a lot of clothing that you can get in the sports area that will do this. There are also some companies that specialize in travel clothing that also fast dries. The reason for this is that you can wash it the night before, hang it up in the bathroom, and the next day it will be dry and you can move on your merry way. As much as cotton is a wonderful fabric, thick cotton does not dry fast. If the hotel is going to wash it, they have dryers, but if you are going to wash it, you don’t have that luxury. Next time you go to the drug store, check out the section that has sample-size and travel-size items. It makes no sense to pack a bottle of shampoo that will last you a month if you’re only going to go away for the week, or even worse for 2 days. Just take as much as you need for that time period only. If you run out of anything, there’s always a store near enough to you that you can probably buy it again. Stick to simple colors. Make sure everything that you take with you matches everything else. If all your tops match all your bottoms and you can bring less and still look good that’s all that matters. Remember you are on vacation and not on a fashion show, you don’t have to wear a different look each day. Don’t pack the kitchen sink, because if you have forgotten anything you can always buy it when you’re there. In fact, it’s also a good idea to take less clothing, as you will probably buy clothing while you’re away and you can wear it as well. 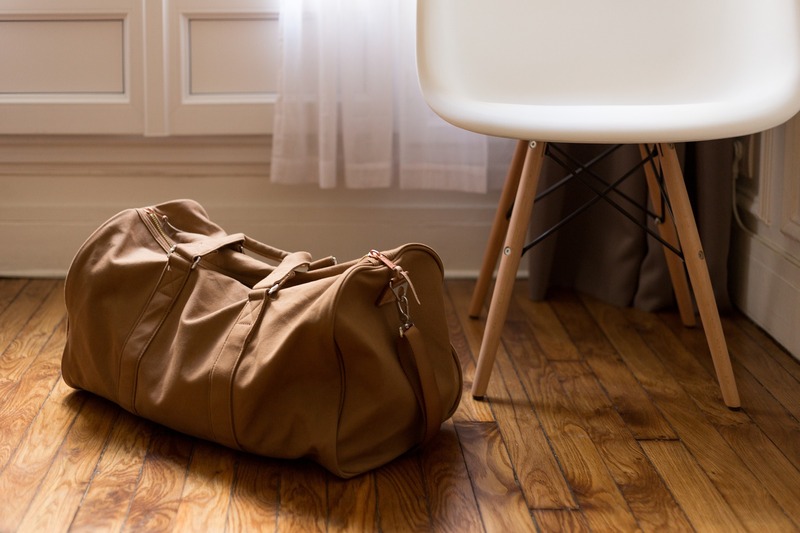 If your bag is not full when you head out on the vacation, then there is room to put things you buy in it to bring them back. Jeans have a special place in traveling light. If you can get away with not wearing them you’ll be happier. Although if you enjoy wearing jeans as you travel, and you don’t have to pack them, then that’s fine. If you have to wash them while you are away we would suggest using a service to wash them for you, because if you wash them they’re still going to be wet by the time you come home. Jeans are great, but they are definitely not lightweight. Although you might not think about it, your travel bag also weighs an amount. We have found that the best simple travel bag is a lightweight, but a strong, backpack. We have a preference for roll-top backpacks, as we can add to them as we go, and roll them smaller when there is not much in them. The standard luggage with wheels are nice, even the smaller ones that are for carry on, but if you are doing any walking at all outside of the airport, you will find the backpack to be a much better choice. Traveling light is really not very hard to do, it is just making sure you understand that you don’t need to take everything you own. If you can wash things easily, you can last for weeks on a couple of pairs of pants, a couple of t-shirts, and a couple of pairs of socks, what more do you need?